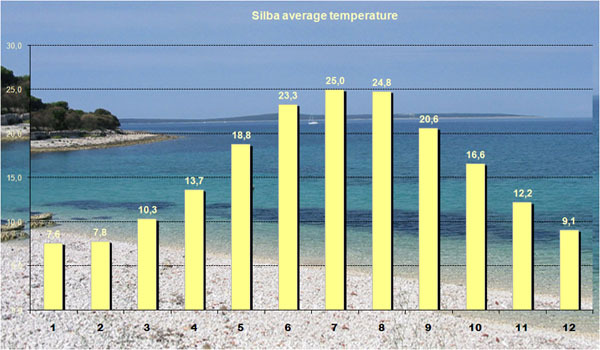 Silba has a mild Mediterranean climate with 2570 hours of sunshinea year with average temperature of 15.1 °C. Beside island of Hvar, Silba is an Adriatic island with most sunny days through the year. Lowest temperature in January and its highest in July. The most frequent wind on the island Silba during summer is Maestral. 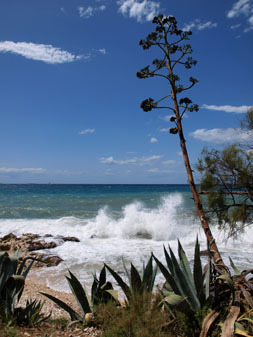 The Maestral takes place each time there is an anticyclone, or area of high pressure along the Adriatic coast. The most common wind during the winter is Bura. Bura is a dry, cold and gusty wind and intensifies the feeling of cold. A strong Bura wind over the sea tears the crests of the waves and causes marine spray. In contrast to the Bura is Jugo. Jugo blows uniformly and causes high waves. In the southern wind regime warm air penetrates the Adriatic sea from NorthAfrica adopting maritime characteristics and thus rain falls.